If you’re on the market for a good plant-based protein supplement, GHOST Vegan Protein should fit the bill. As the name implies, this product should help vegans and vegetarians muscle up and then some, as you’ll find out in this review. Twenty-one grams of protein per scoop. Yields a solid 42 percent of the daily value for protein. Great source of iron. Impressive 20 percent of the daily value. High in sodium. Seventeen percent of the daily value. Directions: Mix each scoop (serving) of Ghost® vegan protein with 8-10 oz. of water or beverage of choice. Vary amount of liquid to taste. If you’re a vegan or vegetarian, it’s possible you’re not consuming enough protein. Bodybuilders who chow on beef, chicken breasts, and eggs, and protein supplements get their protein fix every single day. The former demographic relies mainly on eggs, tofu, beans, and the like. Hey, these are good. However, for some vegans and vegetarians, their protein intake may not suffice. According to the Australian government’s Ministry of Health’s official website, a 19-30 year-old female’s recommended dietary intake (RDI) for protein is 0.75 grams per kilogram of body weight. If you’re a male in the same age bracket, you need roughly 0.84 grams of protein per kilogram of body weight. Say you’re a 21-year-old male who weighs 68 kilograms. This means you need around 57 grams of protein daily. If you eat three times a day, that amounts to 19 grams of protein per meal. On that note, vegans and vegetarians who find it challenging to eat enough protein can rely on a plant-based protein shake to overcome this hurdle. One top-notch product which quickly comes to mind is Optimum Nutrition Gold Standard 100% Plant, which has 24 grams of protein per serving from organic pea protein, organic brown rice protein, and organic sacha inchi protein. Throw in key amounts of vitamin C (100 percent of the daily value) and vitamin B12 (25 percent of the daily value), excellent transparency, and a clean ingredient profile, it’s no wonder Optimum Nutrition Gold Standard 100% Plant is one of the Best Protein Supplements for 2018. It’s that good. Let’s see if GHOST Vegan Protein can dethrone Optimum Nutrition Gold Standard 100% Plant as the best plant-based protein on the market. The manufacturer dubs this supplement “Plant-Based Cereal Milk Goodness,” per its official website. 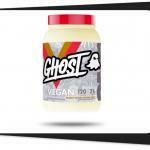 “GHOST Vegan Protein combines a fully-disclosed vegan protein blend (soy free!) with our legendary Cereal Milk® flavor(s) to deliver one ridiculously epic plant-based protein product. Easy to drink, easy to digest…easy to become obsessed with,” per the same source. GHOST Vegan Protein should help you make the transition from a catabolic state to an anabolic one after a hard workout. If you want a healthy and delicious bodybuilding product which supports your fitness goals, GHOST Vegan Protein should be right up your alley. We’re hoping this supplement exceeds everybody’s expectations. GHOST Vegan Protein yields 21 grams of protein per 35.3-gram serving. That gives you a solid 42 percent of the daily value for protein (strangely enough, the manufacturer doesn’t divulge this in the supplement facts. Plus, for reference, a minimum daily value of 15 percent is high). That much should help you muscle up, shorten exercise recovery time, meet your daily protein requirements, and fill nutrition gaps. Sure, it may not have as much protein as Optimum Nutrition Gold Standard 100% Plant (24 grams of protein per scoop), but take nothing away from GHOST Vegan Protein. Twenty-one grams of protein per serving may not be the most among plant-based protein powders, but it will still go a long way. Let’s now probe deeper into the individual components of GHOST Vegan Protein’s protein blend. This should be interesting, to say the least. Whey protein (especially whey protein concentrate) has lactose content. If you have lactose issues, a plant-based protein powder is the way to go. Pea protein is a great way to start because it’s one of the most hypoallergenic proteins on the market. It also doesn’t result in bloating or digestive issues. Moreover, one 30-gram serving of pea protein yields 23 grams of protein, seven grams of carbohydrates, six grams of fiber, and just 0.3 gram of fat. Plus, it also provides 200 IU of vitamin A, five micrograms of vitamin K, five IU of vitamin E, and 400 IU of vitamin D.
Can pea protein build muscle mass? The answer is a resounding yes. Look no further than its impressive l-arginine content. This is an alpha amino acid and precursor to nitric oxide which helps increase blood flow, vasodilation, and muscle pumps. It also helps regulate blood pressure levels and boost cardiovascular function. Not only will pea protein increase vasodilation and muscle pumps, but it will also increase muscle thickness. “Supplementation with pea protein promoted a greater increase of muscle thickness as compared to placebo and especially for people starting or returning to muscular strengthening,” per the January 21, 2015 issue of the Journal of the International Society of Sports Nutrition (via NCBI.NLM.NIH.gov). Experts also say pea protein also helps increase fat loss and stabilize blood sugar levels. It turns out pea protein is more versatile that we initially thought – it helps you pack on some serious muscle mass and safeguard your long-term health. For that, we’re pleased it’s in GHOST Vegan Protein. GHOST Vegan Protein has one protein component which you won’t find in many competitors: organic pumpkin protein. This type of protein gets its muscle-building powers from its seed. It has an impressive amino acid profile which includes branched-chain amino acids (BCAAs), essential amino acids (EAAs), and non-essential amino acids. This is particularly crucial because the body cannot synthesize the first two components. One must obtain them from whole foods and supplements. It’s easy to see organic pumpkin protein is another bona fide health virtuoso like organic pumpkin protein. With these two components, muscle-building is just the proverbial tip of the iceberg – your long-term health will benefit as well. It just doesn’t get any better than that. It’s great they’re both in GHOST Vegan Protein. The clear takeaway: watermelon seed protein is a certified nutritional powerhouse. Not only will it boost your daily protein intake, but it’ll also help improve your long-term health. Those, in a nutshell, are the great benefits of consuming a plant-based protein supplement. Total fat, 1.5 g: GHOST Vegan Protein’s 1.5 grams of fat per 35.3-gram serving represents a measly two percent of the daily value. It’s a bona fide low-fat plant-based protein supplement. Saturated fat, 0 g: GHOST Vegan Protein has no saturated fat content whatsoever. The American Heart Association’s official website urges the general public to monitor its intake of saturated fats for optimum cardiovascular function. This product will help you do just that. Trans fat, 0 g: Trans fats lower good cholesterol (HDL) and raise bad cholesterol (LDL) levels. These don’t bode well for long-term heart health. We’re glad this supplement has zero trans fat content. Cholesterol, 0 mg: GHOST Vegan Protein’s zero cholesterol content bodes well for customers who are monitoring their intake of this micronutrient. Sodium, 380 mg: This is the first red flag of this protein supplement. Its 17 percent of the daily value for sodium is a high value. While sodium helps regulate kidney and brain function and regulate the body’s fluid levels, too much may be detrimental to blood pressure levels. Consult your physician if this product’s sodium level concerns you. Total carbohydrate, 6 g: GHOST Vegan Protein is a low-carb plant-based protein supplement at a paltry two percent of the daily value. 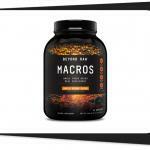 This product should complement your low-carb nutrition goals perfectly. Dietary fiber, 1 g: This product is not a significant source of dietary fiber at a paltry four percent of the daily value. Total sugars, 0 g (includes 0 g added sugars): GHOST Vegan Protein has no sugar content whatsoever. However, it does have the artificial sweetener sucralose (a.k.a. Splenda), which has several side effects. Protein, 21 g: Each 35.3-gram scoop of GHOST Vegan Protein gives you a solid 21 grams of protein from pea protein concentrate, pumpkin protein, and watermelon seed protein. This represents 42 percent of the daily value for this macronutrient. This supplement’s plant-based protein sources also give you other health benefits (improved cardiovascular function, increased testosterone levels and fat loss, better sleep quality, etc.). Vitamin D, 0 mcg: GHOST Vegan Protein has no vitamin D content whatsoever. Calcium, 34 mg: GHOST Vegan Protein is not a significant source of calcium at a measly two percent of the daily value. Iron, 4 mg: This product is a solid source of iron at 20 percent of the daily value. Credit goes to its watermelon seed protein component, which yields a significant amount of iron. This mineral helps ward off anemia, improve sleep quality, regulate body temperature, form hemoglobin, and boost brain development. Potassium, 165 mg: GHOST Vegan Protein is not a significant source of potassium at a scant four percent of the daily value. Vegans and vegetarians will benefit from the plant-based cereal milk goodness of GHOST Vegan Protein after a grueling workout. The manufacturer dubs GHOST Vegan Protein its “Premium Fully-Disclosed Vegan Protein Blend.” After a thorough analysis, we say this supplement is a solid one. Is it ready to dethrone Optimum Nutrition Gold Standard 100% Plant as the best plant-based protein supplement on the market today? Not so fast. First off, GHOST Vegan Protein has its share of upsides. 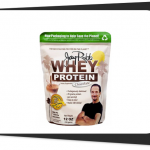 Its 21 grams of protein per serving represents a respectable 42 percent of the daily value. That much should help increase muscle mass, fill nutrition gaps, meet your daily protein requirements, and shorten post-workout recovery time. As for GHOST Vegan Protein’s protein blend, it’s truly one of a kind. You won’t find a combination of pea protein concentrate (80 percent), organic pumpkin protein (70 percent), and watermelon seed protein (75 percent) anywhere else. Among these components, pea protein concentrate is the most promising – scientific studies have consistenly proven it increases muscle thickness. Plus, pea protein concentrate is also a great source of the nitric-oxide-boosting alpha amino acid l-arginine. 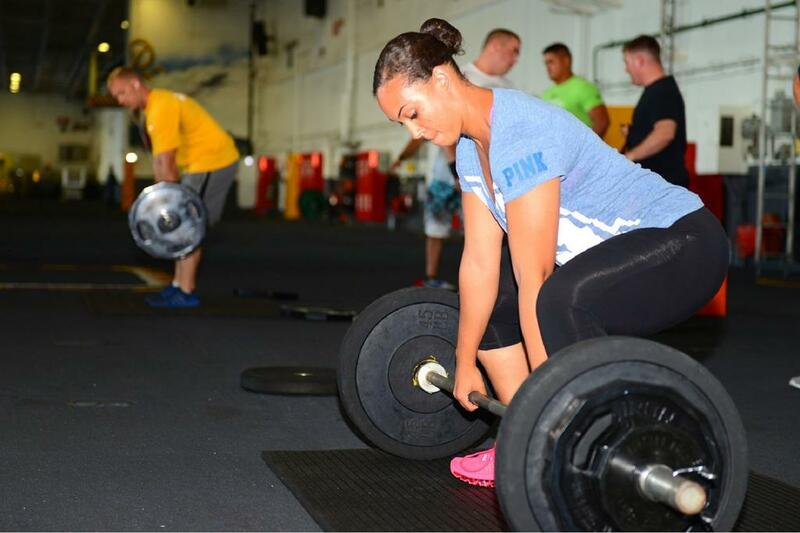 With that in mind, get ready for increased vasodilation and muscle pumps. L-arginine should also regulate blood pressure levels and boost heart health. As for organic pumpkin protein, we like its impressive amino acid profile (which includes BCAAs, non-essential, and essential amino acids). Supplementing with this protein should help you remain in an anabolic state. Watermelon seed protein also has some promise, although it doesn’t have the stellar reputation of pea protein concentrate. The major upside of these three plant-based proteins is their key health benefits: they’re a sure-fire way of ramping up fat loss, regulating blood sugar levels, improving sleep quality, boosting brain, joint, and heart health; warding off inflammation, and increasing energy levels. The downside: some experts say their l-leucine content (the most anabolic amino acid) and bioavailability pale in comparison to the likes of whey protein. Plus, plant-based protein isn’t as digestible as its whey counterpart. Nevertheless, the former’s low lactose content offers vegans and vegetarians a solid and healthy protein fix. As for the other intangibles, the manufacturer does a good job – it kept GHOST Vegan Protein’s total fat (two percent of the daily value), saturated fat (zero percent of the daily value), trans fats (zero grams per serving), cholesterol (zero percent of the daily value), carbohydrate (two percent of the daily value), and sugar (zero grams per serving) levels in check. As an added bonus, GHOST Vegan Protein is also a great source of supplementary iron at 20 percent of the daily value. Like we said, this mineral helps keep anemia in check, form hemoglobin, regulate body temperature, and improve brain development. The company also does an excellent job in terms of transparency for the most part (it didn’t reveal the protein content’s daily value on the supplement facts, which we pegged at 42 percent). We’re relieved this product doesn’t have any shady proprietary blends at all. On the flip side, GHOST Vegan Protein’s most glaring shortcoming is its high sodium content (17 percent of the daily value). Sure, sodium helps maintain the body’s optimum fluid balance and keep cramps at bay, but going overboard may compromise blood pressure levels. It bears repeating: if you’re monitoring your sodium intake, check with your doctor first before buying this product. Another ingredient which raised our eyebrows is sucralose (a.k.a. Splenda), an artificial sweetener which has ties to obesity and other side effects. Stevia, a natural alternative which helps regulate blood pressure and blood sugar levels, would’ve been the better option. Price-wise, GHOST Vegan Protein is slightly expensive at $44.99 for a 989-gram (2.2.-lb.) container. If you want a slightly cheaper plant-based protein supplement ($39.99 for a 920-gram container), try Organic Organic Protein Powder (although the taste is mediocre at best). In terms of customer reputation, GHOST Vegan Protein remains largely under the radar because it’s a new product. It still has to earn its stripes. All in all, GHOST Vegan Protein is a solid yet flawed plant-based protein supplement. While it’s still worthy of a spot in your bodybuilding supplement stack, it won’t trump the likes of Optimum Nutrition Gold Standard 100% Plant any time soon. We agree with most of these claims. GHOST Vegan Protein is a good plant-based protein supplement. While it has a few flaws, it’s still worth a shot. The manufacturer intended GHOST Vegan Protein for healthy and active individuals who want to increase muscle mass, fill nutrition gaps, meet their daily protein requirements, shorten recovery time, boost long-term health, and achieve their daily fitness goals. GHOST Vegan Protein has 17 percent of the daily value for sodium, a mineral which may compromise blood pressure levels if one takes it in excess. This supplement also contains sucralose, an artificial sweetener which has links to obesity and other side effects. If these, or any other ingredient, make you feel doubtful, please consult your doctor before buying GHOST Vegan Protein. Twenty-one grams of protein per serving. Yields a solid 42 percent of the daily value for protein. Pea protein. Rich in l-arginine; it also helps increase muscle thickness. Organic pumpkin protein. Boasts of a comprehensive amino acid profile. Additional health benefits. Boosts heart health, regulates blood pressure and blood sugar levels, increases testosterone levels and fat loss, etc. Solid source of iron. Twenty percent of the daily value. Low in fat, saturated fat, cholesterol, carbs, and sugar. These bode well for long-term health. Great transparency. Manufacturer divulges most of the ingredient amounts (except for the daily value for protein). High in sodium. Seventeen percent of the daily value for sodium may compromise blood pressure levels. Has sucralose. Artificial sweetener which has links to obesity and other side effects. Slightly expensive. $44.99 for a 989-gram (2.2.-lb.) container. GHOST Vegan Protein, the so-called “Plant-Based Cereal Milk Goodness,” is one new player in the bodybuilding supplement industry which is trying to make a statement. Its plant-based protein components should not only help you muscle up, but boost your long-term health. Granted, it’s not a perfect product, but it should still make a difference. 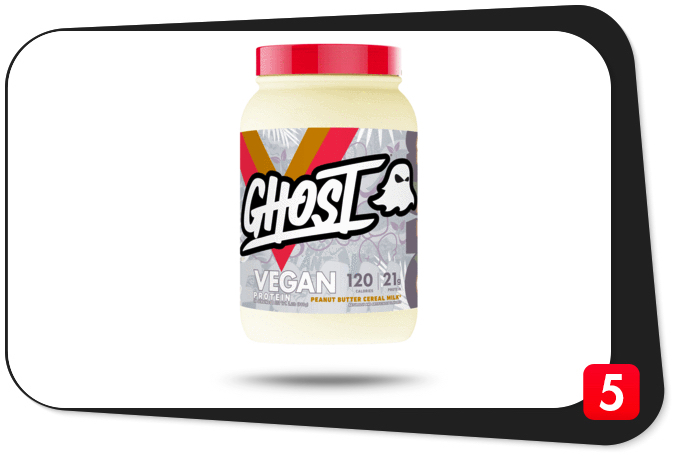 After sizing up GHOST Vegan Protein, we recommend it, but with slight reservations. If the manufacturer can lower the sodium content and do away with the sucralose component and replace it with stevia, we will recommend it wholeheartedly. For now, Optimum Nutrition Gold Standard 100% Plant is still the King of Plant-Based Protein Supplements.